First: Check out my performance yesterday: I personally wagered $17,060 on my picks yesterday and ended up cashing out $26,096.94 for a net profit of $9,036.94 in one single day! So far for the year 2018, I’m up +$22,202.93 in profits from betting on sports, and since December 30th, I’m now up a total of +$65,485.79! And you’ve literally seen it for yourself. All of my tickets and results are fully documented at www.TheWhaleTracker.com so you can have total transparency of my performance. When you’re following my Round Robin system, you have to think like a poker player. Can you imagine any decent poker player panicking after folding a few hands? Of course not! Elite poker players don’t flinch a muscle when they fold bad hands. In fact, the world’s greatest poker players fold on a majority of their hands. Losing a hand is the expected norm for them, but they don’t see folding as losses. To them, folding is a way of setting up the table to win the big pot. Mistake #1: You’re getting too emotional. Think like a poker player. The poker elites don’t break a sweat off the small strings of losses. But what makes world-class poker players so remarkable is how they strike as soon as the iron is hot. Once a great poker player is dealt an opportunistic hand, he can completely take over a table, devastate his opponents, and win the entire pot hand over fist. They do not let small losses bother them, and you shouldn’t either when you’re following me. Once I get on a good run, you’ll see just how much the multiplier effect can have the potential to catapult your bankroll. Mistake #2: You’re betting too much. Can you imagine an elite poker player going bankrupt after folding a few hands? These are guys who consistently fold dozens of hands in a row and still have plenty of ammunition to continue firing away. If you have a losing day with my picks, it’s just like you’re folding a bad hand. If you’re panicking because you’re afraid of going broke after folding a few times, then you are simply betting too much in proportion to your bankroll. With the Round Robin approach, you are only putting into play an affordable amount that’s okay for you to possibly lose and replenish. I’m known to go on a string of losing days – just like setting up a poker table – then all of a sudden – WHAM – I’d hit a series of Round Robin and skyrocket up in profits. You just have to make sure that the amount you’re betting each day is an affordable amount that you’re okay with losing if the patterns aren’t aligning. Put into play an affordable amount that won’t change your life if you lose it. And once I get hot, you’ll see just how quickly these same amounts can make a big change in your financial life when you win. Remember, I have my own money on the line on the same picks I share with you. I typically bet hundreds of thousands to millions of dollars each month on these same picks.If you’re losing, then I’m also losing, but at far, far higher amounts. The only way for me to win is when I can help you win, too. Think about it: If I’m not sure that I would win, then why on Earth would I bet up to millions each month on my picks? So don’t be discouraged when there’s a losing day or even a handful of them. This is not a sprint. It’s a marathon. And you’ll see…when you stick with my picks, over the long run, I’m convinced you’re going to make more profits from betting on sports than you ever have before and perhaps even dreamed of. This is the same system and picks that I used for 30 years and have won some $30+ million dollars with it, making me one of the biggest and most successful sports bettors in history. I can’t wait to help you share into this piece of the pie as well. And the proof really is in the pudding! So far in 2018, I’m up +$22,202.93 in profits from betting on sports, and since December 30th, I’m up +$65,485.79! 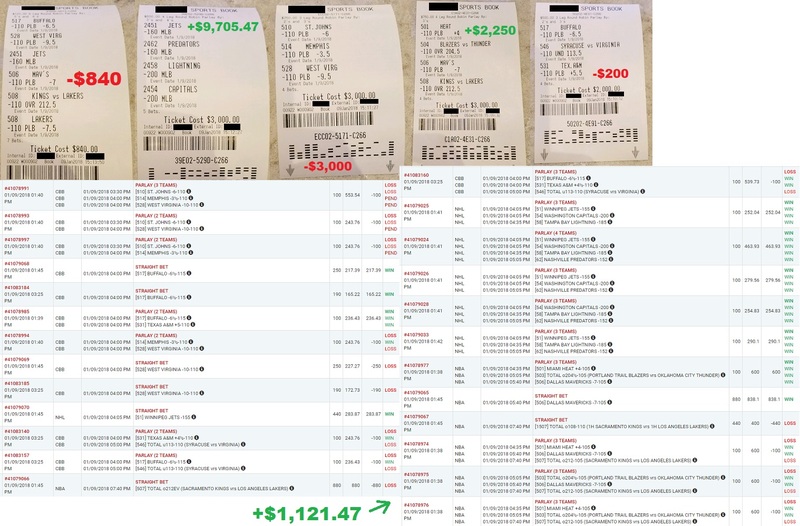 That’s well over $65,000 in profits in just 12 days of betting on sports!